The powerful ES1000 payroll recorder totals hours - including overtime totals - for up tp 100 employees, with automatic break time deductions. Accurate - Automatic totalling saves time and eliminates clerical errors in processing payroll, while two-color printing makes early and late punches easy to read. 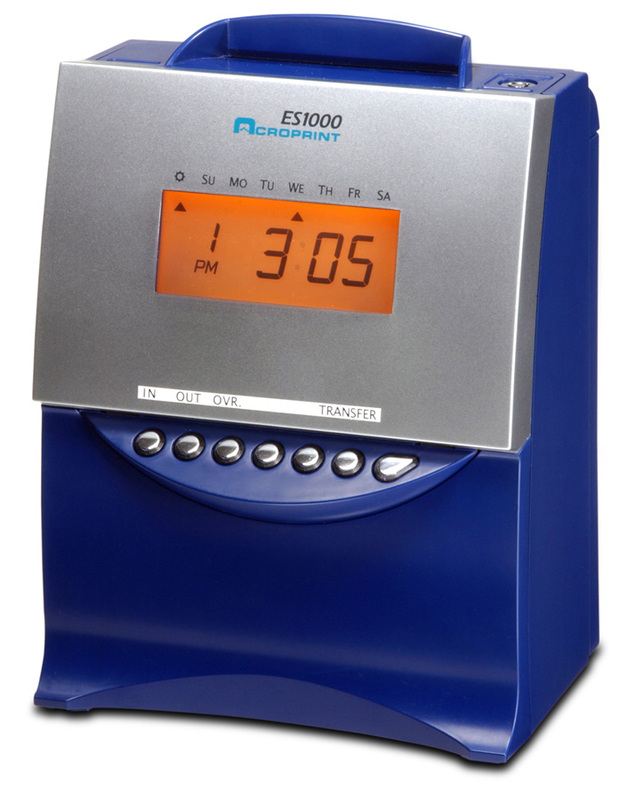 Reliable - This time clock maintains correct time even during power outages, and allows full functionality (up to 200 punches) when equipped with optional N-Cad battery pack. Convenient - The built-in perpetual calendar adjusts the month and year and changes Daylight Saving Time automatically. No need to worry sbout time changes! The ES1000 makes the appropiate adjustments for you. Flexible - The clock prints in standard AM/PM hours or 24-hour format with minute or hundredth increments, offers three-day language selections and handles calculations using either exact or rounded time.